2015 was a year of high expectations for the Kerry Football Club and with a bit of luck it could have been so different as the record speaks for itself. In the first game of the Senior Championship Kerry lost to Aidan McAnespies by 4-10 to 3-15 with McAnespies scoring two very late points after Kerry had a 9 point lead. They lost their second game to the Wolfe Tones by just one point – 4-8 to 2-15 and in their third game they drew with the Shannon Blues 4-9 to 2-15. In 2016 the Kerry Football Club is hoping that lady luck will shine her light on the green and gold in Boston. April 30th is the closing date for home based selection players and with a limited number of selections available it is important to get in touch with the club officers. The Kerry Club is highly respected in Boston. It has been around since 1886 and over that period of time so many of the Kingdom’s finest footballers have played for Kerry in Boston and we hope that this tradition will continue for many more years to come. (Submitted by Connie Kelly, PRO). The Neasden Gaels from London will be taking a flight across the pond to Boston and during their stay in the area will play a challenge against the Connemara Gaels on Saturday, March 19. The Gaels from London and Boston have met several years ago in a challenge. A good weekend is in store. CAVAN 1. That’s the license plate number of one of the first cars in the Irish Cultural Center parking lot on a summer Sunday. The owner, Bernie O’Reilly, will receive the President’s Award for International Achievement at a televised ceremony at Croke Park, the GAA HQ, for his almost 60 year contribution to the administration and development of GAA games in the Boston area and North America. Bernie has seen many changes over the years and been a part of most of them. The number of clubs in the division has more than doubled from when he first arrived, a permanent home has been secured at the Irish Cultural Center, and the Boston GAA is one of the leading divisions in North America in both adult and underage levels. “When people think of the Boston GAA, whether it be here or at home in Ireland, Bernie O’Reilly is the name that first comes to mind for young and old” said John Cunningham, Chairman of the Northeast Division. “This award recognizes all the years of service that Bernie has given, and continues to give, to the GAA. On behalf of the Boston Northeast Division I would like to congratulate Bernie and the O’Reilly family on receiving this award”, added John. A proud Cavan man, Bernie arrived in Boston in 1958. He was an accomplished footballer with his parish club of Drung, and got involved with the local GAA. The Cork football club in Boston secured the services of the new arrival and were fortunate to count the Cavan man in their ranks. Bernie was an integral part of 3 North American Championship teams with the southerners. He also represented his adopted city on many occasions and in April 1962 lined out at full forward in a Boston select team to play visiting All-Ireland Champions, Down, at Dilboy Stadium. Down’s star full back, Pat Rice, was given the job of marking Bernie and had his hands full all afternoon. Even after his prime playing days had ended, he was also part of a Boston Old Timers team that beat New York in 1980, scoring 1-3 in the game. The program for the Down game makes for interesting reading and lists 10 Boston GAA clubs, 8 football and 2 hurling, whose players participated in the game. 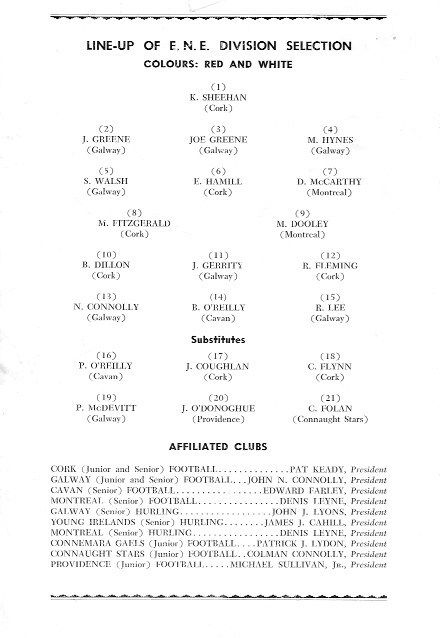 In football there was Cork, Galway, Cavan, Montreal, Connemara Gaels, Connaught Stars, and Providence, with the two hurling clubs being Galway and Young Irelands. Fast forward to 2016 and there now there are a total of 24 adult GAA clubs in the Northeast Division of the NACB. With his native county close to his heart, Bernie was the driving force behind the formation of the Cavan Gaelic Football Club in 1962. The club played at senior level for a decade before succumbing to the changing times. An interesting and little known fact is that Bernie was a referee for 15 years, and the number one referee in town. Knowing the man, I’d say that the players were well behaved when he was the man in the middle making the calls. Bernie was not long getting involved with the running of the show in town and in 1967 he was elected chairman of the Boston GAA. Since then he has been involved with the local and North American board in many different capacities whether it be fundraising or organizing competitions and events. Bernie was involved with arranging to have teams visit Boston, a vitally important endeavor to maintain the visibility of the GAA in Boston and the connection with Ireland. Clubs that visited Boston included seven time Cavan senior football champions, Crosserlough, Leitrim’s Ballinamore, and Civil Service from Dublin. One episode underlines Bernie’s personal touch. The connection with Ballinamore was restored almost 40 years after the clubs’ tour of the States. On a trip back to Ireland in 2007 Bernie presented the captain of the team that traveled, Paddy Dolan, – a Leitrim star player – with a framed photo of the grounds at the ICC. Six of the players who traveled that year were on hand to greet the Bunnoe native almost 4 decades later, and the gesture was much appreciated across the pond. Outside of his contributions to the GAA in Boston, Bernie was also heavily involved in many other social and charitable endeavors involving the Irish Community. Prominent among these was the annual Cardinal Cushing Field Day. 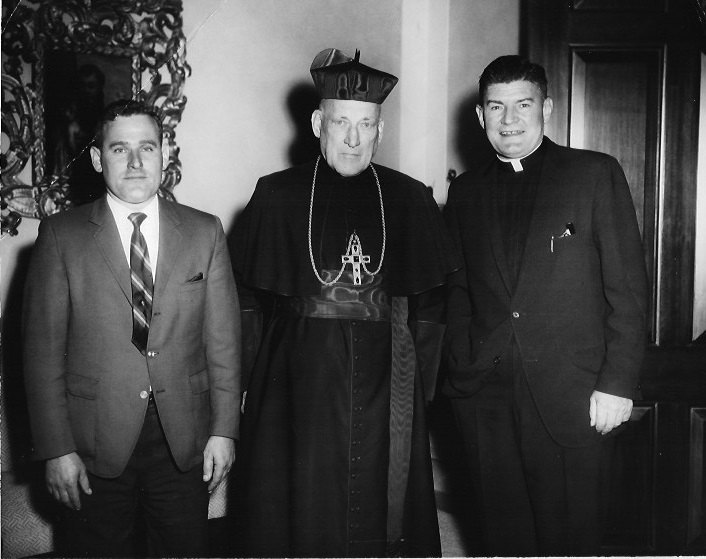 Leading the GAA’s effort, along with New York GAA’s John Kerry O’Donnell, the events raised a half million dollars for the missions in South America over a period of 5 years. 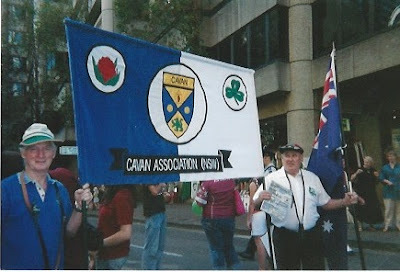 A County Cavan association was formed by who else, but Boston’s number one Cavan man. Over the years Bernie has maintained close connections with Ireland and his native county Cavan, making sure to keep in touch with events at home and visiting frequently. He has not missed an All-Ireland final in 49 years, though as he says himself, it’s a pity that Cavan has not been in any one of them! A self-made man, O’Reilly Auto body was started by Bernie 34 years ago and continues to be a thriving business with 3 shops and some 23 employees. 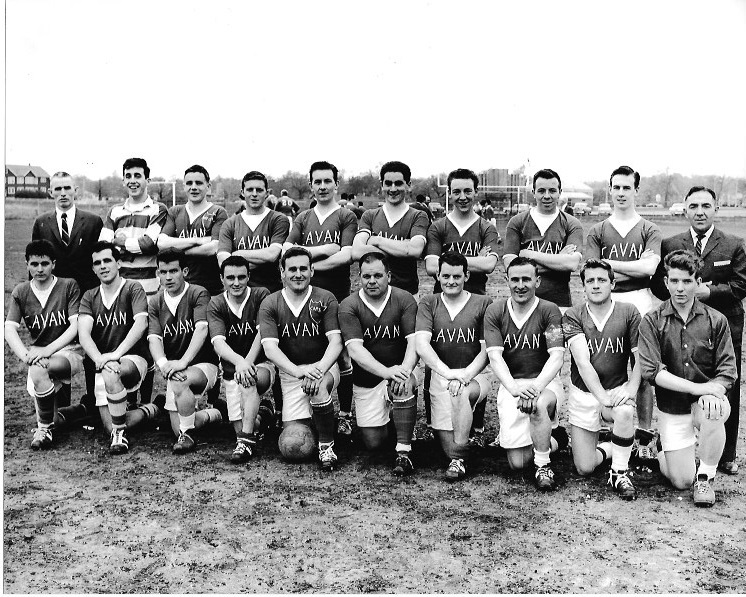 Boston Cavan Team with Bernie fifth from left in front. To this day Bernie O’Reilly is a fixture at the Irish Cultural Center where the games are played just outside the city of Boston. Meeting Bernie, and watching him in action, one would never imagine that the man who hails from the rural community of Bunnoe in County Cavan turns four score years of age this year. The man brims with energy, and when a need presents itself frequently steps in where others who are half his age hesitate. I have seen Bernie maintain order when order needs to be maintained on game day. He is a doer, and his track record speaks to that. 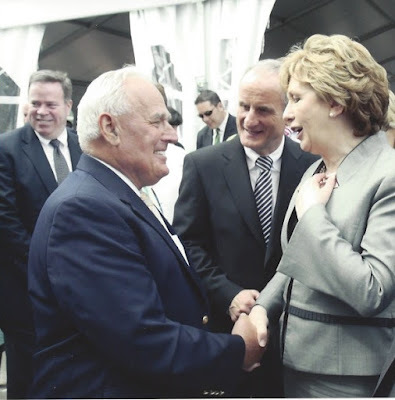 Irish President Mary McAleese clearly awed with meeting Bernie. One recent story involving Bernie must be a first in the history of the GAA. In 2014, when the All-Star game came to Boston, he was one of the prime movers behind the scenes. Having driven to the airport to meet some of the delegation, including the outgoing and incoming GAA Presidents, Liam O’Neill and Aogán Ó Fearghail, Bernie took a bad turn that evening and had to be admitted to hospital with a cardiac ailment. Thankfully he recovered from the scare, although missing out on the weekend’s activities was a disappointment. There was a twist in the tale as he must hold the distinction of being the only man to have been visited by 2 GAA Presidents in hospital. John Cunningham, chairman of the Boston GAA, brought both Liam and Aogán to the Newton Wellesley hospital to visit, and Bernie had all the staff primed for the importance of the visitors; needless to say the Royal treatment was provided to all. Bernie O’Reilly is the epitome of the type of persons who make the GAA what it is as an organization. Doing what needs to be done, forming and keeping connections, and ensuing that the GAA is more than simply a sporting organization, but one that helps and becomes part of the wider community. After all these years Bernie continues to be an integral part of the machinations of the local GAA. In fact, lately he has been the first face to greet people at the gate on a Sunday at the ICC in Canton and often the last at the end of a long day. Although seeing Cavan play on All-Ireland Sunday on one of his trips home has not come to pass, the trip in March will be one to remember. And, you’d never know, one of these years he might finally get to see his native county play in Croke Park on the big day. North American Board Chairman, Gareth Fitzsimons added, “It is sure to be a great occasion back in Ireland, both for Bernie and his family, but also the GAA in the United States and in Boston in particular. Bernie O’Reilly’s contributions over the decades are second to none.” “We’d like to congratulate Bernie on this honor and thank him for all of the work that he has done over the years,” said Gareth. The Presidents awards are organized and presented on an annual basis to honor those who go above and beyond the call of duty in their commitment and dedication to their chosen field within the wider GAA family. A special banquet will take place here at Croke Park on the evening of Friday, March 11th at which all winners will be present. The event on the night will be filmed by TG4. Bernie joins Dave Olsen from Milwaukee and Paul Mulcaire from Buffalo, as well as Pat Uniacke from San Francisco, who are previous North American recipients of the award. from February 9th until March 4th next.